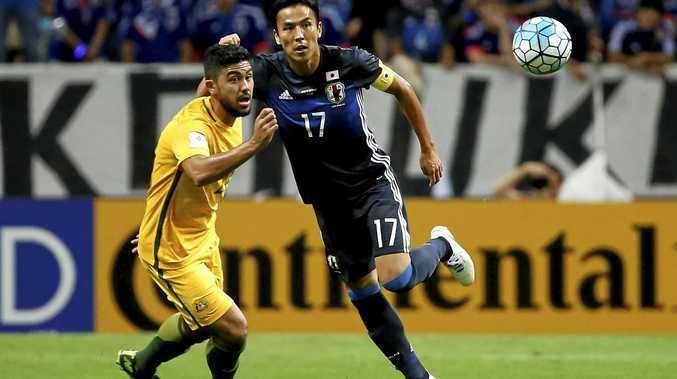 SOCCEROOS stars have warned that a "kamikaze" approach against a Thailand side "we can't underestimate" could leave Australia caught short in its bid for automatic World Cup qualification. But midfielder Massimo Luongo says the players have to get all of the mathematical permutations out of their heads as they prepare for the final qualifier of this phase at AAMI Park on Tuesday night. 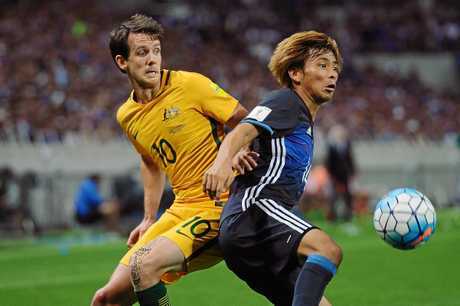 Robbie Kruse said it was "disappointing" for the Socceroos to have had their destiny in their own hands, only to now be reliant on other results after the 2-0 loss to Japan in Saitama on Thursday night. The equation is far from simple. Japan has secured one of the automatic qualifying spots, while Saudi Arabia and Australia are tied on 16 points. But the Saudis have a better goal difference (plus-six to plus-four). So, in as basic terms as possible, the Socceroos must beat Thailand by a big margin to give themselves their best chance. "We now have to win the game convincingly and see the other result as well," Kruse said. "It's disappointing. It was in our own hands, it still is I guess, but it's going to come down to the wire." If Saudi Arabia fails to defeat Japan in Jeddah later that night, Australia would be through assuming it had beaten Thailand. But if the Saudis do win - a distinct possibility given Japan now has nothing to play for - then Australia's winning margin must be two goals greater than Saudi Arabia's. If not, it's playoff time for Ange Postecoglou's side. Not that Luongo will have his calculator at the ready. "We'll just have to go and just ignore that," he said. "Go out there and just get the win and just worry about the goals later." The playoffs would start with a two-legged affair against the other Asian group's third-placed team next month. That could still be any one of South Korea, Syria, Uzbekistan or China. If the Socceroos win that, another home and away tie against the fourth-placed North American team awaits in November. At the moment that looks like it could be Panama, Honduras or even the USA. But first things first, it's Thailand in Melbourne. The Thais are bottom of Group B, with just two draws from nine games and with a goal difference of minus-17. They lost 2-1 at home to also-eliminated Iraq on Thursday night. 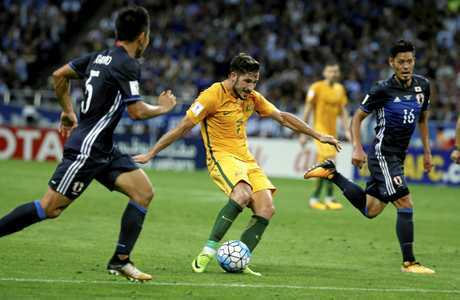 But the Socceroos came away from Bangkok with their tails between their legs in November after being lucky to escape with a 2-2 draw - a result that is looking increasingly costly now given how things stand. So Mathew Leckie knows Australia cannot take the world No.130 lightly. "We can't underestimate them," Leckie said. "We know how hard it was in Thailand. "Obviously we're very strong at home but we're just going to have to play one of the best games we have for the national team. "We need goals and unfortunately we're going to have to worry about the other game and it's not totally in our hands. "But we're just going to have to do everything we can to get a good result." It's a tough situation, but Jackson Irvine said his side could ill-afford to throw caution to the wind. "It's funny, I think people are starting to get sick of us saying that our approach doesn't change," Irvine said. "But that's all we can say. We have our style, we have our system and we do believe in it. 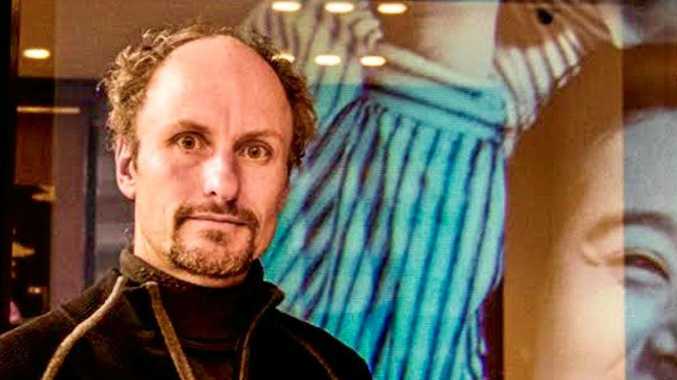 "There'll be times where it works, as people saw in Russia (at the Confederations Cup). And then there's times like (against Japan) where it struggles. "But as we keep growing and keep changing the boys on the pitch, we'll be able to find different ways to get through and make those chances and be more clinical. "I don't think we'll go kamikaze. "Our approach - I think this is the first time in these qualifiers we haven't scored - won't change because we do score goals. "Obviously we're going to have to score a few but we're capable of doing so and fingers crossed a good performance will be enough to get us to Russia."